Yes…Buddy Baker was snubbed as many analysts would say about this year’s NASCAR Hall of Fame Class of 2019, but the biggest snub is not looking at the grass roots of the sport. There is a constant concern from those who operate and cover the short tracks across North America that NASCAR really doesn’t focus a lot on those small tracks that race each week near your home, especially with their NASCAR Home Tracks. Yes, NASCAR Home Tracks gets a nice television ad here or there and yes, they have their own website. But a good amount of the top space is more dedicated to K&N and Modifieds. Which gives those who say that NASCAR doesn’t help the promotion of short track racing more ammunition to their argument. The focus tends to lead to more towards the top three series. Yes, it is understandable because that is where most of the money flows into the NASCAR office with high dollar sponsors. With the exception of the induction of Richie Evans, the voting panel has been consistent to vote in drivers, car owners, and crew chiefs from the top three series. Heck, they are inducting car owners that are still active in the sport and still have teams winning races. At this point, why not just induct Jimmie Johnson in as well if that is going to be the norm with them. The 2019 nomination & voting panel consisted of 60 members. Four of those members fall under the heading of “Historic Short Track Operators.” The remaining 56 is a mix of NASCAR officials, media, larger track operators, drivers, crew chiefs, current Cup champion, and community leaders. Two names stood out on the balloting results, Larry Phillips and Mike Stefanik. Two drivers who are pure grass root short track drivers. Both have Hall of Fame records and should be in with any class. It is appearing that what we are seeing with the voting process is the same thing that many are stating, grass root racing continues to get overlooked by those who could help the process of inclusion. All five inductees are very worthy of being in the Hall of Fame, but some may question if some of the candidates should be inducted now since they are still technically active in the sport. The NASCAR Hall of Fame could be a greater value to all of stock car auto racing by doing more for the grass root racing community. It could be a great vehicle (pun intended) to help show fans who are very familiar with the top three series that there is something local and regional in their area. Entertainment that is family affordable, fun and most of all participating as future stars can see where they can start and learn to improve their skills and go from a weekend warrior to a big time star. As the voting panel represents a great voice to the history of stock car auto racing, they need to be more aware as to who they vote for and place a person into the Hall of Fame from the grass root level will have more value and impact as those grass root fans will have a bigger reason to visit the NASCAR Hall of Fame. Someone they saw racing in their backyard is in the NASCAR Hall of Fame for the success they had at their track. Look at the attention received when Richie Evans was inducted into the Hall of Fame. There are five seats, and personally one of those seats should looked at very closely from someone at the grass root level, especially since the Hall of Fame has already established a great list of honorees. The NASCAR Hall of Fame could be that connection that many see missing in our sport today. Fix that disconnection from the top of our sport to the weekend warriors battling at our local tracks each weekend. It’s been about a month since I got a text message in early hours of the morning that Michael “Lumpy” Lemke had passed away after a brief illness. Until now, I have been fairly quiet about my emotions about losing a friend. When I got word that his health was failing, my personal emotions shut off and went into work mode because this was basically the first time in my 15 years of auto racing writing that I would have to write about someone passing away. My mind was focused on what to write, get some research, etc. The day before Lumpy passed away, I was at the Wisconsin Collegiate DECA conference in Delavan, Wisconsin when I got word that he was not responding to his family. I went to my Notes app on my iPhone and started typing what became the announcement on the ARCA Midwest Tour website. Bob Abitz talked to me that morning and really helped me with information on his early days. The rest I basically knew from our times together. That announcement was done by noon that day. A friend suggested that I reach out to the family and get their blessing on the announcement. I sent it to Lumpy’s sister Kim, who responded back thanking me and that the family gave their blessing to it. Then…like everyone else…we just waited for the news that none of us wanted to hear come out from the hospice. About an hour after I completed that article. Ricky Brooks texted me and gave me the sad news that another friend, Kim Brown, General Manager of New Smyrna Speedway, lost her battle with cancer. Needless to say, my afternoon and evening was full of emotions in my head. Losing one friend and knowing that soon, I would lose another one. At 1:30am, Kim (Lumpy’s sister) messaged me with the news. This wasn’t a story that needed to be posted right that minute, the family and close friends needed their private time. When the family posted of his passing on social media, the article was sent to be posted and shared on social media. A few days later, the family asked me if I would write the obituary. It was an honor to be asked to do that and it’s something that I will am forever grateful to do for my friend. Along with being part of his celebration of life party. Lumpy and I had a great professional relationship. As many of you know, he really didn’t share much about his personal life. He was always focused on his business and being a tech director or consultant for anyone who asked for his expertise. For me, Lumpy was a teacher. He taught me a lot about why some rules are this way and why others are that way. A common thing I heard from him was that he was always trying to find ways to keep the cost down for the racer. If he ruled the racing world, rules would have only been changed every three years, so teams weren’t spending too much during the off-season. I remember asking him about why he kept the Super Late Models he wrote the rules for, using two-barrel carburetors over four-barrel. He told me a story that a few years ago when he was at the Winchester 400, he was in a conversation with engine builders and other tech officials about motors. He told me that engine builders confessed that motors using 2-bbl carbs didn’t need to be refreshed as often as those running 4-bbl carbs. Again, he was looking out for ways to keep the cost down for the racers. He was doing what he could to keep short track racing alive for the future. As a PR/media/writer he was a value in helping me explain different technical things in order for the average fan to understand, not just the technical ones. At the same time, he taught me something that I will always continue to use in the future. That is to be understanding and respectful to the engine builders, tire manufacturers and part manufacturers. Because they do everything they can to support racing from providing parts for the teams to providing contingency awards for tracks and series to pass along to their competitors. Especially when It comes in my role as a PR director for a track or series. He even reminded me when my role went to be a reporter that those same engine builders, tire manufacturers, and part manufacturers advertise with who I am writing for and that same respect needs to be given there. A week before he passed away, I went with Gregg McKarns and Tom White to visit with him in the hospital. He and I didn’t get a chance talk one-on-one, but with the help of Joe Nemechek and John Hunter Nemechek, I was able to bring a smile to his face and witness the classic Lumpy I knew one last time. Both Joe and John Hunter sent me video messages for me to play for him. Lumpy was also a gracious host if anyone ever stayed at his “white house.” He loved his steak with fries, seven and seven and beer. One example of what kind of a guy Lumpy was to me…Lumpy, Tom White and I were to fly over to South Africa on a Sunday night. Lumpy and Tommy were going out of O’hare and I was going out of Milwaukee. A severe thunderstorm was over Atlanta and our flights got cancelled. I was trying to get on the flight the next day to Johannesburg. I was having a rough time getting booked on that flight when all of a sudden, Lumpy calls me and told me that I was all set. I was like…huh? He said that when he went to Delta customer service to get him and Tommy re-booked, he also included me. That was a friend looking out for a friend. One trip to the RPM workshop in Reno, Lumpy and I had a flight that took us from Milwaukee to Kansas City to Oakland to Reno. As we were coming into Oakland, the plane made a left hand turn and all of a sudden, I was looking out the window and noticed the ocean and then I looked down and realized we were about to fly over San Francisco. Lumpy admitted that he had never been to California and I was amazed to know that about him. As I was leaning over him and looking out the window, I started to see the Golden Gate Bridge. I pointed that to Lumpy and then showed him where Alcatraz was, then the Transamerica building. From our trips to Norway Speedway to our weekend adventure to I-44 Speedway in Lebanon, MO and then our trip to South Africa. We did a lot of memorable things together. Even putting together a few Tech Seminars and Promoter Roundtables with Five Star Race Car Bodies, which to this day, made positive advances for all who attended those one-day seminars. It may not hit me until the season opener on May 6th at Madison International Speedway when I walk in the tech building and realize he isn’t there. But, I am already missing our phone calls, his posts on Facebook, or comments to other posts. I am going to miss his stubbornness. I am going to miss his bluntness. I am going to miss his advice. I am going to miss watching how he interacted with race teams and how he addressed issues at the driver meetings. I am going to miss his overall unique personality. The 49th Annual Snowball Derby highlight package could easily be surrounded by the music and classic quotes from ABC’s Wide World of Sports. It had the thrill of victory along with many agony of defeats. First, the thrill of victory. Anyone who saw the last three laps between Christian Eckes and John Hunter Nemechek saw how, in my opinion, bump and run racing should work if allowed at a short track. Both gave each other a little nudge, but not enough to take them out from challenging for the win, but just enough for one to get a slight advantage. It was a chess game where the margin of victory for Eckes was 0.017 seconds. In that minute, the last three laps were contested, it became an instant classic. As far as the race is concerned, yes many will say that the “controlled cautions” changed the outlook of the race along with not making it a fast moving race. We all need to understand why the change was last minute and this was something that track officials pretty much had to learn as they go kind of thing. Could live pit stops changed the outcome of the race? Well, we can Monday morning quarterback this all day. But the finish is the end product and what we got was a memorable finish. There are a couple of stories that could make the "Agony of Defeat." First was Chad Finley who was having the race of his life, leading over 200 laps and was the car to beat and was awesome on restarts. But with 20 laps to go, the alternator ended his dream of holding up the Tom Dawson trophy. His victory would have been one of the more sentimental stories in the history of the event as another driver doing what he can to be successful and a win in this event, may have been the catapault needed for him to get to his next goal. Hopefully, his strong run was enough to gain that needed attention. The major talk on social media was the incident between Stephen Nasse and William Byron near the end of the race where the two made contact while battling for second and causing Nasse to go in the wall. Nasse made sure that Byron would not have his chance to win by taking him out during the caution. Within seconds after the incident, many went on Twitter and noted that with that move, Nasse will never get an opportunity on the upper level of the sport with moves like that. This may be a surprise to those who tweeted that, but Nasse wasn’t looking at the Snowball Derby as an audition, he was looking at it for a race to win. He confirmed that in a text message to me after the race. “I haven’t tried to move up in racing since I was 15, when I realized it wasn’t worth it,” Nasse said via text message. Yes, the emotions were high and his incident he did to Byron during the caution was, in my opinion not a smart move, at the same time understand his emotion that caused that immediate reaction. To me, this is something that some who don’t follow short track racing as close as many of us do, don’t see week in, week out when we visit short tracks and series. There is a great mix of teams that are either a professional development team all the way down to a few guys putting a car together to come out and enjoy the sport with no aspirations of being the next star in any of NASCAR’s top three series. They want to race. The Snowball Derby has this mix every year and sometimes these teams clash around the emotion of their individual goals. Some young drivers come in and will literally drive through veterans to get noticed or not respect the hard work and effort their team and other teams put in preparing their cars to compete in an event. When that happens, we see caution filled races versus good, hard short track racing. The feeling that Nasse expressed to Speed51.com was expanded in his text to me. You can respect his emotion when he had a mechanical issue in qualifying, had to win the last chance race to make the field and start 30th in the race. He was one spot away from challenging for the lead and one tap changed it all. That was the agony of defeat. As the sun rose over Pensacola the next morning, many are already looking ahead to the 50th running of the Snowball Derby, we are all talking about short track racing and another young star may have taken a big step in his career. I have gotten to know Matt & Quinten Tifft pretty well over the last five years. It started when Matt raced for Tim Schendel at tracks in Wisconsin like Marshfield Motor Speedway. It has been fun watching him develop to where he is today. Back in September, at his first race back from his surgery, Quinten was kind enough to share his perspective of Matt went through this past summer. 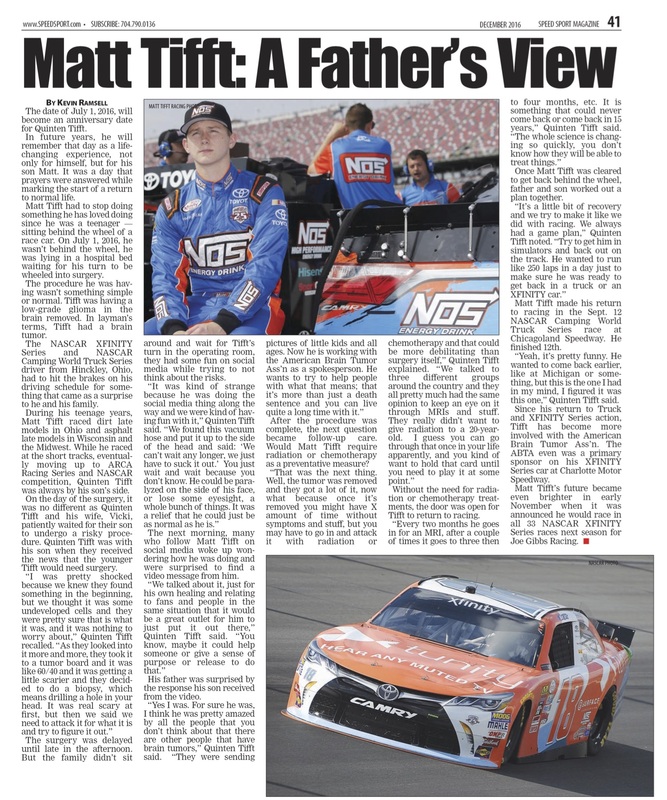 This article appears in the December 2016 issue or Speed Sport News. Get your subscription today at speedsport.com. Yes, the media attending 5 Flags Speedway in Pensacola, Florida to cover the 49th Annual Snowball Derby will have some rules they must agree too in order to cover the event, but try as anyone may, preventing the thousands of fans and team participants will not stop from making this event being noticed on social media. No, there is nothing wrong with that. Why? Just think of the buzz the next five days will create leading up the milestone 50th Annual event next December. Five days of free advertising from the masses of people is not a bad thing. In just less than two hours into haulers parking on Wednesday, social media sites like Facebook, Twitter, Snapchat, and Instagram are already filling up with different people’s take of what they are seeing with this great event, and you know what, that is a good thing. My friends at Speed51.com will do an awesome job of providing coverage as the official media source for the event, but at the same time, those postings on social media could help them with the latest news and insights to their audience as well. It is a win-win for everyone involved this weekend. What will be fun over the next five days is watching not just the media’s perspective of this but teams and fans view of this event. Take a look at the entry list and follow drivers on different social media platforms. It is a guarantee you will find a nice variety of thoughts of the event. Some will be hilarious and some may show the raw emotion that comes out of this event. Those who are attending the event, social media could be your pit road reporter. While many will say this race needs to be televised live on television, many will have to just give up on that complaint this year and enjoy the pay-per-view broadcast from 51 and the social media updates from the many attending and participating in the 49th annual event. A few things to remember about social media, it’s about engagement to your already established audience. Events like this could help drivers, teams, tracks and series gain more followers. Again, this is a good thing overall for short track racing, it helps create visibility and interest. Re-tweeting on Twitter, sharing on Facebook, etc. also helps the overall landscape of short track racing as you are sharing your personal interest of not only this event, but the sport overall to your friends and family. The 49th Annual Snowball Derby could be one of the most visible short track racing events on social media and it could be a big payoff overall for asphalt short track racing, especially with the number of participants coming from all over the United States and Canada. Also factor in the international exposure from our military members who were based at one time in the great Pensacola area and became familiar with 5 Flags Speedway. While short track racing may not see a payoff today, it is a great building tool for the future of our sport. Social media is allowing the different character of the participants to show, it is allowing engagement with each other, and sharing things with our fellow followers will create new interest. For those reasons, this could be a good week to show the power of social media in asphalt short track racing as a benefit and not a headache. Just a few hours prior to the green flag to the final race of the 2016 NASCAR Sprint Cup Series season finale, NASCAR’s Chairman/CEO Brian France met with the media for a brief press conference. Not sure if Mr. France was ill or just plain nervous with his constant wiping sweat off his brow and nose, but he appeared that he wanted to get this over and done with as quickly as possible, even cutting off Bob Pockrass and Dustin Long from their questions. My personal thought from the overall press conference was that this didn’t need to come across as a “me versus them” atmosphere, which it did appear in my eyes. The initial thought that came through my head was that if he was more available throughout the year to the media, rather than a few times during the year, the atmosphere may be different. Instead, we saw the media being aware they have a limited amount of time with him and tried to get many things answered from him. As I reviewed the transcripts from the press conference, there were a few things that stood out from it. First, was about Daniel Suarez winning the NASCAR XFINITY Series Championship, which Mr. France commented about this being a victory for the Drive for Diversity program. The question now comes is this, who is the next D4D driver in the pipeline ready to be the next Daniel Suarez? I don’t think many will argue that Suarez earned his way to that championship. He had victories in the NASCAR K&N Pro Series East and in the NASCAR Mexico Series and recently won his first NASCAR Camping World Truck Series race. He beat Kyle Busch at Michigan to earn his first XFINITY victory and had to win the race at Homestead to secure the title. Where is the NASCAR Media machine to promote and showcase the next up and coming talent? Why isn’t NASCAR Hometracks being used as a constant vehicle of promoting the local and regional talent on almost a daily basis? The talent starts at the local NASCAR Hometracks and with the efforts made to promote the top three series, an equal effort needs to be done to find that next driver like Suarez. When I worked for ASA Racing from 2009-13, one of my duties was to stay in constant contact with the Member Track promoters and PR reps reminding them that we want to share their stories. Whether it’s a feature on a local driver, community involvement, special race event, etc. the sanctioning body had their website and media resources available to help them get the word out. Local names became national names, especially around the time of deciding a national champion. Mr. France was asked about the decline in attendance. Yes, weather is always a factor with attendance. Just ask your local short track promoter on race day if they see rain in the forecast. But, to say there is a little impact because Jeff Gordon and Dale Earnhardt isn’t there makes me scratch my head. Jimmie Johnson was there and was going for a seventh title and look at the reaction from the crowd when jumped out of his car on the frontstretch. I may be wrong, but this almost appears as if someone was looking at the sport from a myopic point of view, from the outside looking in, not from being in the trenches, sitting in the suite surrounded by “Yes” people and not sitting in the stands with the fans. If you listen to the Sirius-XM NASCAR channel, you constantly hear that when a driver retires, the fans go and seek a new driver to follow. The fans don’t go away because a driver retired, they go away for many different reasons from interest, economy and more. Some will go away because of the politics and negative talk on social media and message board platforms available today. They don’t have the time to deal with the BS they read or listen. The need to build interest and excitement are some interests and excitement is part of the evolution of “The Chase” format we see today. Last weekend had three series titles come down to literally the last lap. They have something going, now the key is to build from that going forward, especially to capturing the young fans. I found this quote interesting when France was talking about ratings being down. Does this mean that we will soon see a NASCAR television app on our Apple TV, Roku, Google Chromcast, and other devices like these? If not, may not be a bad idea to start and be transparent with those numbers to the media. How many viewers subscribe to the channel? How many view the website? In my opinion, he is right. Today’s society is going from a watching television during primetime to watching on Hulu or Netflix when the consumer has their own time to watch it whenever they want to watch it. But when he was asked if NASCAR is ahead of the game in all of this, his answer left a question mark. “I don’t know. I don’t think so. They been working on their things, too. I think there’s a lot of changes going on. A lot of changes in entertainment period, right?” France admitted. “Prime time is very different then it was ten years ago, five years ago. You’ve got Netflix as an example. You’ve got all kinds of things that are changing in the media world. This, my friends, may be the root of the entire problem that NASCAR is facing today. They are not keeping up with the pace of the ever changing technology and if they don’t this is a big area that will draw fans away from the sport. When the leader of the company says “I don’t know” and “I don’t think so. They been working on things,” this is where we need to look carefully at the leadership and advice the leader is receiving from their advisors. On August 26, 2011, the ASA Racing app was introduced for both the iPhone and Android phones (Click here for announcement). As far as I recall, it was the first app out from any sanctioning body. Something to this day that I take personal pride in creating on my own. It wasn’t that difficult to do. There is a lot of complaining on social media regarding the media rules set forth in regards to the Snowball Derby. Many are complaining that it is ethically not fair or just plain wrong. This is my take as someone who has worked three Snowball Derby’s where I not only worked under Speed51.com, but also with the track itself in organizing their victory lane activities. First, Speed51.com is entering their 16th consecutive year as the official media partner of the Snowball Derby. They replaced the previous media partner which was…oh wait…sorry…they were the first one. Prior to 2001, this race was pretty much a regional race that got some local attention, race reports in racing newspapers and magazines, and if time permitted a highlight package on TNN’s Raceday. 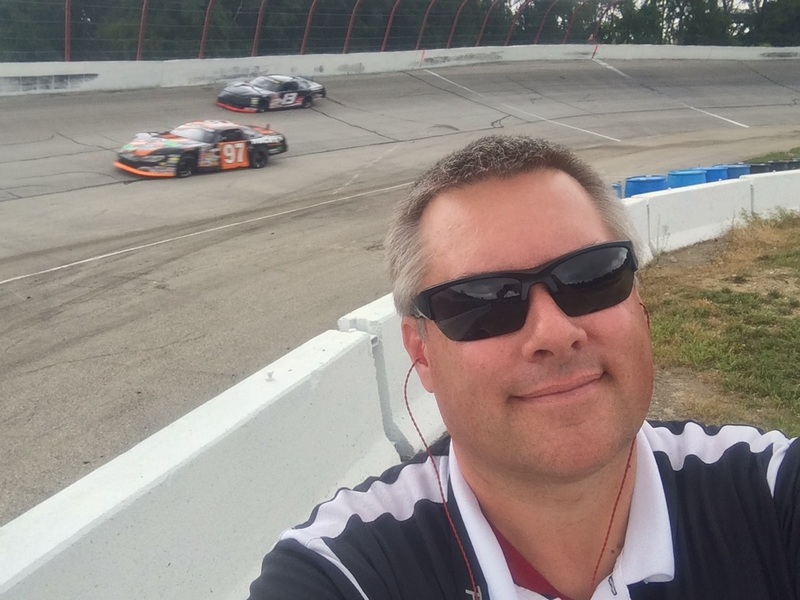 Tim Bryant, Promoter of Five Flags Speedway, saw Bob Dillner’s vision of what he wanted Speed51.com to be, that is a website that focused on asphalt short track racing. They both agreed that in order for this goal to be accomplished, they needed to have a signature event each year. That signature event became the Snowball Derby. Over the last 15 years, both sides have stayed loyal to each other and have built up this event from a regional presence to a national presence. Their partnership has benefited both sides. Speed51.com has evolved this event through their Trackside Now, live play-by-play blogging updates, to a live internet radio broadcast, then a few years ago being the outlet to provide the first ever live television style coverage of prestigious short track Super Late Model race. Can anyone disagree or deny this? Both sides, the tracks and Speed51.com, has seen benefits. The track now has a national audience and more interest, to the point to where they are selling tickets at a much faster pace, camping space is selling faster, and they have been successful at getting financial help from the county department of tourism because of the economic impact the Derby brings into the area. Speed51.com, along with being an original short track media site that includes a wide variety of interests that includes a news website, live PPV broadcasts, driver public relations, and more. They have maintained their position and continue to be a strong website to this day. The partnership between Five Flags Speedway and Speed51.com in regards to the Snowball Derby has been so successful, that Speed51.com has been granted some special privileges for the event. Some of those privileges are the ones that many are complaining about on social media today. Some are saying that Five Flags Speedway is hurting themselves by restricting media from doing live play-by-play social media updates and some in the media are saying, well if that is the case, we aren’t going to cover the event. Umm…where was this reaction in the last 15 years? The online comments like this isn’t making the track do an about face. Their recent amendment to their media policy was simply done because they are falling in line with what is in the NCAA digital media guidelines to their tournaments. Hey…wait a second. Doesn’t the partnership that 51 and Five Flags Speedway almost sounds like the same thing that CBS/TBS has with the NCAA for their basketball tournament and other sport partnerships? Oh wait, my bad you are going to tell me that these aren’t the same thing. Moneywise no, but how the process came to be where it is at today…yes. Both worked together on stepping up the event and now we have the success. You don’t see ESPN courtside for the tourney games, but they cover it and do under those NCAA guidelines. I honestly have to laugh when some reporters who cover NASCAR Sprint Cup events chime in on social media with their thoughts about the policy. Why are you even commenting? You are not adjusting your travel schedule to hurry from the Sprint Cup banquet in Las Vegas to catch a flight to Pensacola, Florida to cover it on that Sunday morning. And even if the banquet was a different week, is your outlet sending you to cover it? If the race was that important to those reporters, be a lot reporters coming in to Pensacola on Saturday afternoon or Sunday morning. In fact, may warrant a chartered flight. Take away your personal feelings of the people from either side involved in this event. Who they are, how they operate or how they are towards you isn’t a factor for you to complain online. The fact is, their partnership in the last 15 years have brought them to where they are today. Neither side owes you anything. But they are more than welcome to grant you a credential, as long as you are a legit media outlet, to come and cover the Derby and provide your unique insight to the event. They do appreciate the audience you will bring to the event. But, as far as any live play-by-play blogging, video, radio etc. Speed51.com has earned that privilege to be the only ones to do it. They are coming in with a 15-year record to back that up. This is not about ethics or moral media reasons. This is about two parties working together on making an event what it is today. If anything, you have to appreciate their efforts and the benefit it has become for short track racing. If you are a diehard short track fan, you simply have to respect their decision and thank them for what we see at their event every year. Your negative comments and threats of not going, isn’t going to change their business model. It’s working for them and they have the proof to back it up. By the way…I asked on a Facebook post what other short track events have media restrictions? A few hours later…no response. Their guidelines isn't hurting short track racing overall. Other promoters could use your help and should keep their mind open. Snowball Derby is a unique thing unto itself. The tide took a 180-degree turn when word got out about the media policy for the Snowball Derby among those in racing on social media. The famous knee-jerk reactions were loud and clearer than people’s thoughts about the recent Presidential election. It simply took one tweet about this part of the media policy for the 49th Annual event. Right away, people were calling out Five Flags Speedway, Speed51.com and Bob Dillner about this policy. Many felt that this was 51’s way to control that they can be the only one to do anything live at the event, it is unfair, it’s not right, etc. Some have even said they won’t attend the event as a fan and some in the media simply said they will not cover it. The main issue has to do with play-by-play type blogging along with using live video sources like Periscope, Facebook Live and YouTube Live. Without hesitation, the knee-jerk reaction is that they can’t do any social media updating whatsoever. That is not true. All they are asking for the credentialed media to do is not provide a lap-by-lap twitter update of the races. The obvious reason is because Speed51.com has the exclusive broadcast and media rights for the Derby…for the 16th year in a row. For full disclosure, I am friends with Speed51.com and do provide stories to them from time to time. I do not have an exclusive affiliation with them. Instead of going on and sharing my thoughts on social media, I thought it would be best to see how this is looked at in other sport entities, and it didn’t take long. In regards to live video, did you know that last month the NFL instituted a new league policy that from kickoff to an hour after the game, NFL teams can no longer post their own video on social media? It could result in fines up to $100,000. They can only re-post NFL-owned videos on Twitter and use Snapchat. They also cannot live stream games or plays. The reason for the fines was because teams were violating existing rules. The next question is why these entities feel like they have to limit media people from doing play-by-play blogging, tweeting, etc. The answer is simple, they have a product they are trying to protect, a product that someone bought the rights too in order to have this agreement that they are the ones allowed to do anything that is considered live, up to the minute communication. Those involved with those rights get what their agreement means, and why they need to make this as part of their policy. Let’s take a look at NASCAR. Both MRN/PRN have the radio broadcast rights while NBC/FOX has the television rights for various NASCAR events. It would not be a surprise if they are concerned about media members doing live lap-by-lap blogging, streaming or tweeting without permission from them or NASCAR. They have invested millions into having those rights. As a business, their hope for a return on their investment (ROI) is to profit off of what they purchased, I.E. selling advertising because of those exclusive rights. The NCAA is very strict especially during the March Madness basketball tournament time. Your local television station cannot show immediate highlights while the game is going on or for a certain time after the game. That is because the television stations that own the rights, want to be the only one to air those broadcasts. Yes, there is an argument to be made when it comes to the short track level. Passionate reporters/bloggers feel that by them doing live blogging or streaming, they feel they are doing what they can to help promote a short track event or track. They feel that they are trying to provide a service, but get upset when that service they want to provide turned down. They immediately go on social media and bash the decision by saying things like they don’t want our coverage and this is why short track racing is failing. Again, yes, this could be a part of the reason we are seeing a decline in some aspects of short track racing. But, there has yet to be a guaranteed proof that live play-by-play blogging has helped or hurt our sport. No one can officially say that because this person or entity did lap-by-lap blogging kept so many fans at home rather than paying an admission ticket. At the same time, that blogger cannot definitely say that all of their 8,000 or so Twitter followers watched every lap-by-lap tweet. What must be realized by all is that with today’s economy, return on investment is the number one thing in business and they must see positive results from it. Why are sponsors pulling out of this sport? It’s because they are not seeing a return on their investment. A short track driver told me a while back that he when the economy was good, he could go to a local grocery store and the store owner would be more than happy to give him some money in return for advertising on his car. When the economy got tough, that store owner told the driver as much as he likes him, money is tight and if he isn’t seeing an ROI on the sponsorship, they can’t continue to sponsor the team. Sadly, many are saying that they are seeing a bad trend in racing. That trend is just give me money and I will see you next year for another check. There is no teamwork through that sponsorship cycle to work together in ensuring that there is an ROI for the sponsor. There are no business-to-business planning from either side to make the most of what is available to them. Driver appearances, car appearances, sponsor business-to-business campaigns (I.E. television manufacturer working with a hotel chain to get their televisions in their hotels), and more are not happening, especially in the short track world. It’s only the give me money and I will put your logo on my car or billboard at my track/series plan…nothing else. The smart promoters and teams are doing more with their sponsors to prove that they are doing what they can for each side to see an ROI in their partnership. Some in the media are in the same mindset. You give me a credential and I will cover your race…the way I want to cover it and not respect how you would like to have it covered. This egotistical attitude that some in the media pour out on social media or in their columns doesn’t help the sport. It sinks to a lower level. You know what, promoters are starting to recognize this and are starting to “drain the swamp” themselves. This is about respect on all sides. This is about finding ways for all sides to be successful and find a way to where each side finds a positive return on their investment into this sport. We all need to take a step back and stop to understand why a track/series and other sport entities make decisions like what we are seeing with the Snowball Derby. Their reason isn’t to piss people off, it’s a business decision for those who have invested in their event. As a member of the media, it is a privilege, not a right, to be given a credential to cover it and we simply need to respect their wishes and together find ways for all sides to be successful. While they may not want you to do lap-by-lap tweeting, but your service during the event may still be something to enhance it for those in attendance, watching the pay-per-view, or just looking for periodic updates. There is a win-win in this for everyone. Just take some time to think about that versus jumping on social media and screaming at the top of the mountain. Back in September, I covered the Chicagoland Speedway Cup weekend for Speed Sport News. 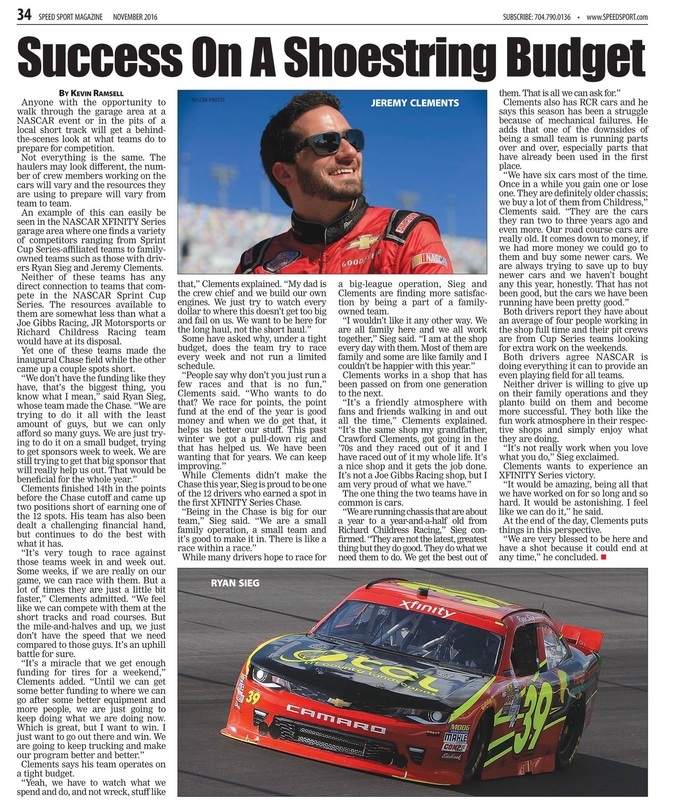 During that weekend I had a chance to sit down with Ryan Sieg and Jeremy Clements to talk about their race teams and either making the NASCAR XFINITY Series Chase or just missing out. You can read the article below as it appears in the issue. CLICK HERE to get your subscription to Speed Sport News today! When discussion about the NASCAR K&N Pro Series and ARCA Racing Series presented by Menards is on the table, time after time, the talk surrounding the discussion focuses on the series being development ones with drivers who don’t hang around. It also focuses on the fact that drivers only compete for a season or two. Let’s call a spade a spade and not argue these points. Each series have a valuable place to young aspiring drivers who want to elevate to the NASCAR Sprint Car Series someday. The NASCAR K&N Pro Series has its East and West divisions which give drivers a great opportunity to race in full-size cars that give something similar to the feel in the upper levels. But they race mostly on one-mile or less ovals and some good road course experience. The ARCA Racing Series could be looked as being a step between K&N and Trucks to give drivers experience competing on bigger ovals including Daytona and Talladega. In fact, racers looking at running a Truck or XFINITY car at Daytona in February need to prove themselves in the ARCA 200-mile event first. There are typical complaints that rich kids are buying these rides for the opportunity. But, when you walk any garages, you will see a variety of teams with different incomes competing at each event. Yes, there are also a few veterans that come back year after year, and compete all season long to make K&N and ARCA strong series. Sadly, the K&N Pro West Series recently lost one of those stable veterans, Jack Sellers who left us at the age of 72. ARCA has famous names like Frank Kimmel, Tom Hessert, Josh Williams and others who compete throughout the year. If there is one thing that is consistent in each of the series, it’s car owners who provide rides. On the K&N side, there is H Scott Motorsports with Justin Marks, Jefferson Pitts Racing, Bill McNally Racing and more. ARCA has Venturini Motorsports, Cunningham Motorsports, Mason Mitchell Motorsports, etc. Another complaint about the revolving door of drivers is that it’s tough for a promoter to advertise with drivers who relate with drivers they recognize within a series. They also could say it’s tough for fans to follow a driver year after year. Many would compare this with what they see today in various Super Late Model series across the country, with veteran drivers who compete on a weekly basis. For example, in the Midwest, many grew up with Trickle, Shear, Detjens, Ziegler, and more. Today’s SLM scene will have a Sauter, Fredrickson, Pollard, Grill, Wilson, and more. As much as we would like a series identity to be about drivers who compete in it, maybe it’s time we simply acknowledge the honest truth that these series are what they are, a development series. The marketing needs to focus on that fact. The advance promotion should be about stars of tomorrow racing at a facility close to fans’ homes. These are drivers who someday, you may see race on television every Sunday. This is an opportunity to watch these drivers develop before your eyes and provide memories that you saw them race before they made it big. The good thing about these two series is that you have drivers who are hungry for a victory and championship as they try to enhance their resume for future plans. At the same time, no matter if it’s a pay for play ride or someone who is coming with their own team, they are on an even playing field with the rules in place by each series. If they can’t prove themselves in either of them, their stock could go way down and may be stuck racing Super Late Models for the rest of their career. Both the K&N Pro Series and ARCA Racing Series have a dual purpose, be a place for drivers to develop and provide great racing for the fans. Each series has a great resume of drivers who have competed in their series. Appreciate their purpose and continue to support them when they come to a track near you. Who knows…the driver you see and meet at events might be the next superstar in auto racing. That is something a promoter can use for future promotions and fans can relish looking at a hero card from a development race series.